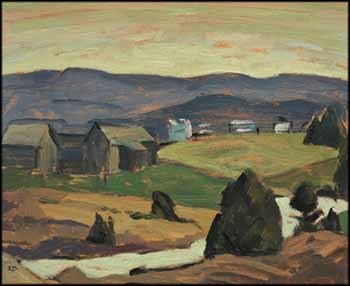 One of Quebec's outstanding painters and printmakers, Edwin Holgate was invited to join the Group of Seven in 1929. While he was based in Montreal, he bridged both the English and French components of its art community. He was a founding member of the Beaver Hall Group and was also a member of the Canadian Society of Graphic Art, the Montreal Arts Club and the Pen and Pencil Club. Holgate had a love for Quebec's rural landscape, and he built a log cabin at Lac Tremblant in 1925 as a base for sketching trips. A longing grew to immerse himself in the countryside, and in 1946 he left Montreal and acquired nine acres of land at Morin Heights, a village nestled amid lakes in the Laurentians. Holgate's approach to form was one of reductive simplicity, and he emphasized volume. In Morin Heights, the trees have a conical solidity, standing like sculptures in the open fields. The misty background mountains give a sense of depth to the scene, presided over by the arc of the sky, which Holgate depicted using exquisite tones of pale blue and peridot green.